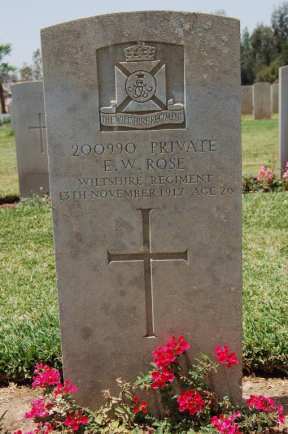 News has been received that Pte Ernest William Rose, Wiltshire Regiment was killed in action in Palestine on November 13th last. Deceased, who was 21 years of age, was the eldest son of Mr and Mrs Rose of 42 Tugela Road, Chippenham. He joined the Wiltshire Territorials in September 1914 and left England for India in October of that year, He remained in India till the regiment was ordered to Egypt on active service. Mr Rose, the father has received the following tribute to the life and character of his son. I very much regret that illness in hospital has prevented me from writing sooner to express my sincere sympathy in the loss of your son Ernest William. He was as you no doubt have been officially informed, killed in action on the 13th November near the villages of Kustineh and Elmesmiyah and he is buried near the former village. He is a great loss to our company, for he was popular and during the last 18 months, the period I have been in command of B Company and knew him, he developed wonderfully and was a fine, strong, well set up and reliable soldier. Latterly he has been Mr Glendening’s batman: I choose him at Kirkee, when Mr Glendening came to the regiment, for this work because I considered him a most trustworthy and loyal fellow. In this work I came into contact with, as he helped with our Company officers mess and we always got on excellently. Mr Glendening was ill and did not come up to the trenches with us, so your son returned to ordinary company work. Except that he acted as runner for his platoon commander, work which he performed creditably. I may add that I wanted to promote him when we were still in India as I considered he was entitled to advancement but he preferred to remain a Private, much to my regret. We have indeed lost a splendid fellow and feel the deepest sympathy for you in losing him who had been absent from home for so long and whom you had not the opportunity of seeing since he had reached a full and exceptionally fine manhood. 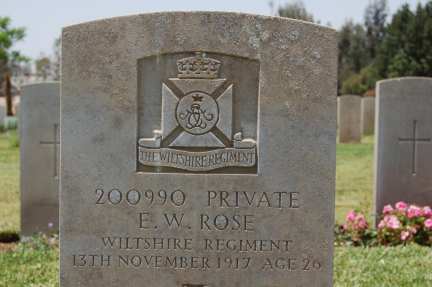 In affectionate memory of my dear brother (Ern) Pte E Rose, Wiltshire Regiment killed in action in Palestine on November 18th 1917. And fought and died for England and the honour of the race. Far from those who loved him, but in hero’s grave he lies. Always remembered by his loving sister Daisy.